Flat UI Free is made on the basis of Twitter Bootstrap in a stunning flat-style, and the kit also includes a PSD version for designers. 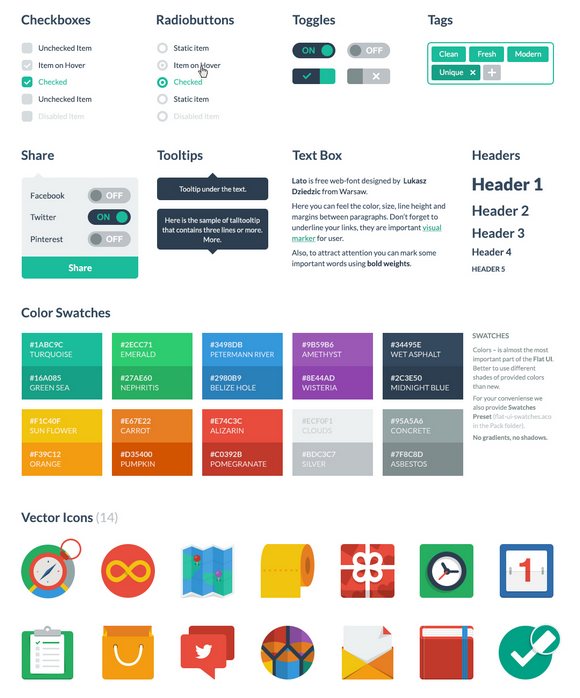 Flat UI Free contains many basic and complex components which are great for designers to have at hand: buttons, inputs, button groups, selects, checkboxes and radio-buttons, tags, menus, progress bars and sliders, navigation elements and more. Colored, stylish icons can easily be modified and used in a wide variety of projects, as they contain original layers. Glyphs are also available in psd, html/css and svg formats. The kit also includes color swatches – no worrying over color choices here – with 10 colors that perfectly suit each other. Flat UI Free is made using the Lato typeface, which can be downloaded for free.